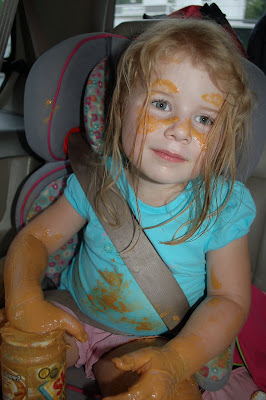 Turns out our Family Home Evening of making peanut butter balls was a little too fresh in her memory. She had a big ball of peanut butter in her hands. Lucky for her Johnny and I have a good sense of humor!! My favorite part is she has the peanut butter war paint look going. She even painted on eyebrows. She did a great job for not having a mirror. Plus I bet the peanuts did wonders for her complexion. That is pretty funny though. that is so funny! i don't know if i would have laughed as much if it were my own kids though. Lila is living the dream. 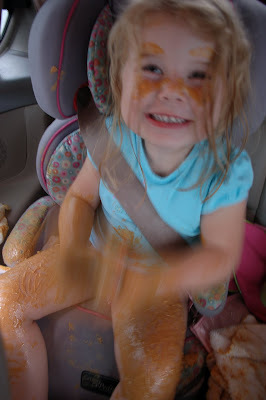 I've wanted to smear peanut butter all over myself too. that is amazing! seriously amazing. she is a sneaky little thing. oh my gosh so funny. She looks delicious! She is so funny! And you are so good to be able to laugh at it. Yes, Lila is a lucky girl to have two cool parents that didn't completely freak out over that. I'm so glad that you had the foresight to document her shenanigans with the camera! Very funny. Well, it could've been worse than Peanut Butter, right? Em!! Oh my, I just found your blog and I am rolling!! I have tears I am laughing so hard! She is so sweet and innocent!! Your blog is so cute! Miss you guys! Butu now I can keep pup with your fam through the blog! Oh my goodness! That is hilarious. I would have died...I'm so glad you and Johnny could laugh about it! That is HILARIOUS!! I am still laughing! This is hilarious. I'm glad you two have a sense of humor. :) LOVE the photos. Good thing that camera was handy. We miss you guys! Lila looks so grown up! Em that is so funny...and your right she is lucky you guys have a sense of humor!! It's so great you took pictures to remember the moment. Those are the best to look back on. I need to call you!! Hope to see ya soon! Lila is such a fun little girl! We had so much fun camping with you guys in VT. Hopefully we can do it again some time. 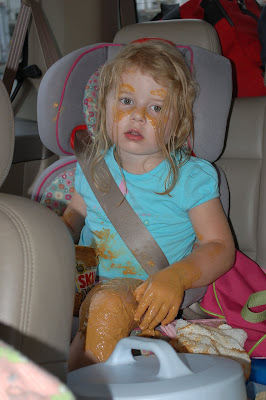 And this time hopefully Lila won't lather up with a condiment on the way to the camp ground. This is unbelievable! I'm so glad you took pictures. She and Juliette must have been conspiring, only this totally tops the Nutella incident.